It’s been almost a year since I launched this blog, which I hoped to build into a news and commentary site about ultra-endurance running and cycling, as well as the occasional mountaineering and polar expedition. The first eleven months of Half Past Done have been a fun learning experience, both in tracking the worldwide ongoings of an endeavor I’m passionate about, and in testing the waters with the commercial viability of a Web site. But there have been setbacks as well — the long hiatuses necessitated by travel and racing plans, the absence of other voices from a site that I hoped would delve deeper into the community aspect of endurance racing, and lagging readership that no doubt is partly a result of the first two. For the past few weeks, I given deeper consideration to all of the projects I’ve involved myself in, how they’re progressing, and where I’d like to focus my efforts. Right now, I have my hands in a lot of baskets — an aging personal blog that makes no income but still sees a solid number of readers, a side job designing newspapers for a company in Alaska, freelance magazine and newspaper article efforts, book project collaborations, a rising stream of unfinished personal book projects, and of course, Half Past Done. I’ve come to the conclusion that there’s no desirable way to do any one of these things well if I keep trying to do them all. Something has to give. For the remainder of the winter, I plan to keep Half Past Done on an extended hiatus. I’m not going to kill the blog, and I will likely even continue to add occasional columns and commentary, especially as Antarctic expeditions and the winter racing season get underway. Individually, I’m training to trek 350 miles across Alaska backcountry on the Iditarod Trail next February. This will be a huge physical and personal undertaking, and I want to spend as much time preparing as possible. This means less time writing about those preparations, although I do hope to include some updates from time to time. By which I mean to say, if you are interested in these endeavors, don’t unsubscribe to this blog just yet. As for the projects where I plan to shift most of my focus, progress is moving along nicely on a co-authored biography about Tim Hewitt, a man who has trekked more than 1,000 miles across Alaska to Nome an astonishing seven times, once fully unsupported. 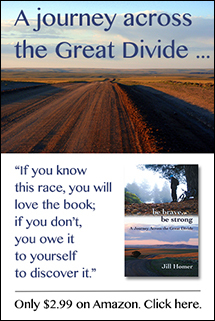 Tim’s adventures are rich with humorous and sometimes harrowing tales, and my aim is to write a relatable and entertaining book that will pull readers into the adventure, while at the same time documenting just how incredible Tim’s feats are. We don’t have a defined publication date yet, but I plan to make this project my main focus until it is done. Another book project that is nearly complete is my third memoir, “Becoming Frozen,” about the first year I lived in Alaska. In some ways, it’s your typical “cheechako” (that’s Alaskan for first-year Alaskan) tale about making an impulsive and last-minute decision to move to Alaska, relocating to the delightfully quirky fishing village that shares my name, discovering moose fences and studded tires, finding a grizzly bear foraging in the back yard, building furniture out of junkyard lumber, sea kayaking in an ice storm, and bike commuting through feet of snow. The “twist” with this story is, of course, my unlikely embracing of endurance sports, specifically snow biking. A year earlier, while living in Idaho Falls, my lifestyle was that of a party kid who stayed out most nights until dawn, worked long hours in the afternoon and evenings, and frequented a gym as a way of striking some kind of balance. My outdoor life had become almost nonexistent. Shift that forward one year to Alaska, pulling a bike outside into the winter darkness to spend hours pedaling over packed snow in subzero temperatures. It was a major turning point in my life, and the depth of this transition is a story I want to tell. I’ve been lagging on this book for personal reasons, but I’m getting closer to finally finishing this project once and for all. I will post updates on my book projects here as well. Until then, thanks for reading. Forgive me for the current neglect of this Web site, but it’s for good reason. I’ve enjoyed your blog immensely over the last 6 months after I found it while doing research to see what my son was getting into with the Tour Divide Race. Do you have time to receive and post guest articles once in a while? Maybe the future will bring a collaborative site for you. Thank you, Dave. I appreciate your comment. I would love to post more guest articles and columns. I sent out e-mails and all but begged for submissions early on, but I haven’t come up with a viable pay structure, so for now it’s on a contribution basis and people are understandably not as interested. However, if you are anyone you know is interested in submitting something, I’d love some help in keeping content fresh on this site through the winter. Race reports, book excerpts, opinion pieces, gear reviews, new race announcements, expedition announcements … anything is welcome. You can submit articles to jillhomer (at) gmail (dot) com. Thanks again! I love this web-site, I think it’s very informative and motivational. I think I read a book by Tim Hewitt a while back about one race or trip he did, but I’m not sure. If so, I would love to read about some of his other adventures as well. You can’t keep everyone happy, all the time, so please don’t take down the site! Just my opinion. Been loving your posts, Jill, but I can understand your motivations for putting it on hiatus for a while. There’s only so much time in a day. Jill: I’m jazzed and can’t wait for your book with Tim…I’m SO not an adventurer’er in real live, which is maybe why I’ve been so enamoured following your exploits these past years (been a reader of your main site since you lived in Juneau). Loved both your books…you are an excellent writer with the capability to capture and express in words so many tiny thoughts and details that escape me on a regular basis. Understand about being busy…post what you can when you can…I’m sure we’ll be here waiting with baited breath for something new. I like it that I can come here for news of REAL adventures that I won’t find elsewhere except by accident. And just so you know…I’m ANXIOUSLY awaiting word of you and Snoots going for something BIG. I think you and wheels go together like peanut-butter and chocholate…but that’s just my meandering thoughts. (I also like that you post about Beat’s adventures too…he is a real force in ‘going out there and doing it). In the meantime I’ll just have to console the crazy adventure (reader) junkie in my with your other site. Train safe and have fun!